Plot summary: Chief Whip Frank Underwood (Kevin Spacey) manipulates the author of the leaked education bill into standing aside, allowing Frank to introduce and take credit for a revised bill. 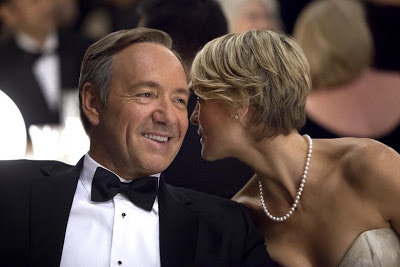 Frank uses journalist Zoe (Kate Mara) to get Daniel Kern to withdraw as candidate for Secretary of State, by scurrilously bringing to light an old Op-Ed from his college days. Frank then uses the Philandering Philly Congressman (Corey Stoll) to persuade the real writer of the controversial editorial to claim that Kern wrote the piece, sealing his resignation. Frank's final play is to have Zoe start the buzz that Catherine Durant should be Secretary of State. Meanwhile, Claire (Robin Wright) sacks 19 members of staff. Comments: This episode is all about seeing Frank manipulate people to get what he wants, manoeuvring himself onto the Education Bill, and Kern out of State, earning the thanks of Durant and Vasquez into the bargain. It's swift, neat and clever. That said, there's something about the concept of leaking via physical meetings and text message that worries me. Why doesn't anyone try to discover where the leak comes from? I know that the author claims he got his staffers to shred it, but still. Would Frank really meet Zoe directly in a world of a hundred camera phones waiting to catch any odd meeting (as used so powerfully in Chapter One?) There's something about a story of political leaking that seemed far more plausible in the 1980s when electronic tracking was de minimus. Why doesn't anyone wonder where Zoe is getting her information and question her meteoric rise? Wouldn't the Editor-In-Chief ask for, if not her source, then more context? Once again, the charity storyline seems dull and irrelevant, other than showing what we already know - Claire has balls of steel: it had better pay off.